Calistoga, in the beautiful Napa Valley, is a glorious place to visit any time of the year. But I cannot wipe the smile off of my face after travelling through the greater Napa valley again this fall. The grape leaves and tree leaves were vibrant and magnificent this year in their yellow, orange, and red hues. 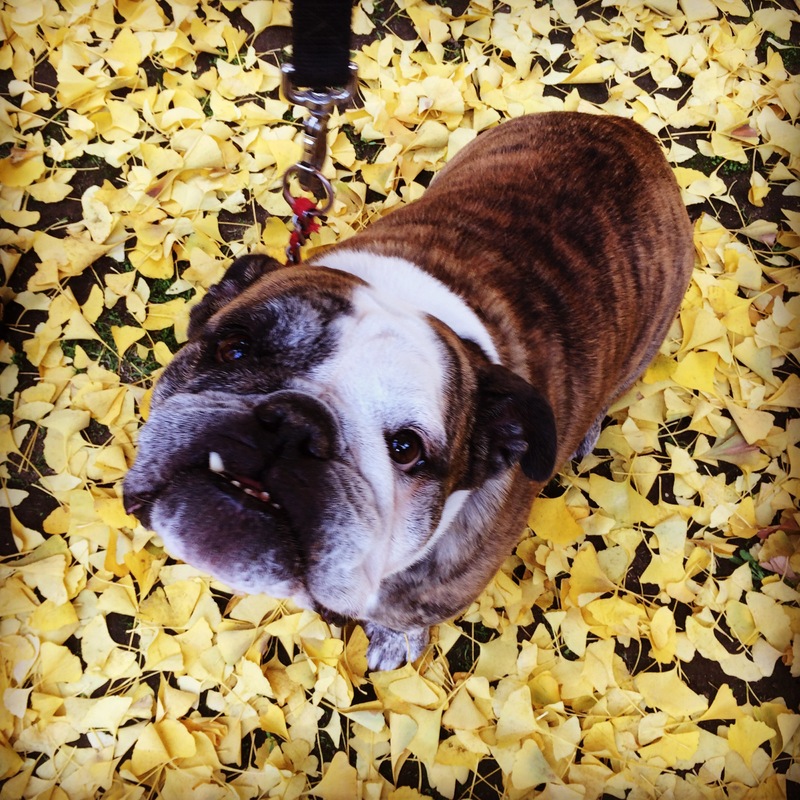 Even Amelia, who puts the Bulldog in Bulldogtravels, enjoyed her fall adventure this year. Lovely smile Amelia! She looks like she’s enjoying it as much as you. Indeed. She was very happy to be out and about for sure. You must be the fastest blogger in the wild wild West. I posted my comment 3:50 your time. Your answered 3:51! Sharpshooter, eh? Test question: do you sleep with your phone in the bedroom? I do only for its alarm clock. But I turn it to airplane mode so it doesn’t go off or disturb or buzz. Airplane mode turns everything off. No alarms are alerts for anything other than the wake up alarm. And yes I keep it on while I am on the treadmill which I am right now! It should be 17:13 on the treadmill now, time to hit the road home? Still a bit short today, but hey! It’s Friday. Have a lovely week-end Jenny. My regards to Eric. They sure are. It was epic. Thanks for the well wishes. Have a lovely week Jenny. I’m sure you would enjoy it. Thank you. It really is a special place. It’s on the far end of the Napa Valley. It’s a little slower. The food there is good. There’s a few good shops and antique stores. It’s a lovely place to stay and explore the valley from there. I never get tired of going there. This was the first time I took the bulldog though. Ha thanks! She is a little love bug.